An American Between Worlds: Forget About the Laundry! 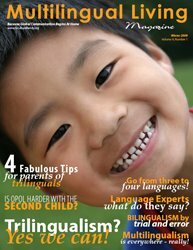 You may not have heard of Patricia Kuhl, Ph.D., faculty member in the Department of Speech and Hearing Sciences at the University of Washington and one of the world's leading authorities on language development, but if you have kept up on your research about children and language learning, you will have certainly come across her work. (Photo of the University of Washington is from the Institute for Learning and Brain Sciences homepage). For example, you get what you give: When the craze for Baby Einstein DVDs came (and stayed) many of us were dismayed to see how many parents bought into the belief that all they had to do was to put their infant in front of a DVD program and magically he or she would gain the cognitive and language skills we so desired for them to have! Like an infant’s version of the movie “The Matrix”… plug in our baby and three hours later they will have downloaded what they need. Luckily for humanity, this isn’t the case. It still takes direct human interaction for infants to learn our languages! We are still needed in the lives of our babies, at least when it comes to learning a language! Go ahead and put in that DVD but don’t walk away! Watch it with your infant and have some fun – you may even learn a thing or two and you will definitely be providing your infant with crucial social interaction while having fun at the same time! 2. Social interaction is essential in language learning for infants at this age. To get the benefits of #1 above, it must be through social interaction. The infants who only had exposure to the DVDs or audiotapes had no phonetic learning and “scored at the same level as the English-only babies.” This means that you are essential in your infant learning your language, or any language for that matter. There is nothing that can replace you and others in providing your infant what he or she needs to pick up language! 3. Timing is important in language learning. At 9 months, infants are in a sensitive period in their language learning. And they are using all of their senses to do so. As Dr. Kuhl says, “language learning draws on all aspects of infants' cognitive abilities, including their attraction to 'motherese' (a form of exaggerated speech) spoken by adults to babies; the statistical learning that infants engage in by analyzing language; and the ability to follow the gaze of another person to an object to understand what they are talking about." So, the next time you realize you have just spent a few hours cooing and talking and singing and reading out loud to your infant (or any age child for that matter) don’t feel guilty about not having done the dishes or the laundry or the shopping! Give yourself a big pat on the back for providing your child with the building blocks for a lifetime of language! All it takes is us being present and engaging with our kids. Wow, who would have thought it was so easy! Interesting stuff, Corey! Thanks for sharing! Yes, we totally need to know this and be reminded of this over and over again. Sometimes we just want to take the "easy" way out by putting in a DVD and tell ourselves that they're learning "German" now ;) When in fact it'd be a lot better if we were to sit down with them and interact MORE. Thanks for reminding us! I know Dr. Kuhl from her book The Scientist in the Crib. We bought that before our son was born. Too bad we don't have too much time to read it now. My sons also love Baby Einstein style videos, but they watch two Brazilian "rip offs" so they can learn Brazilian folk songs alongside the classical music and they love it. Well, as I've written in the magazine earlier, I'm impressed at how much English Kelvin acquired and is still acquiring just by watching TV and playing online. Of course he has interacted a bit with English speaking people since he was born, but still... Of course when he was younger this didn't really make too much of a difference, but now that he's interested and ready, he learns quite a bit! Hi Alice and Lilian - ah yes, we also have one or two Baby Einstein DVDs and I'll be the first to admit that I am relieved when the kids enjoy them and give me a bit of a breather in the day. ;-) But luckily we know that the DVDs are only a small part of the language learning process (and maybe not at all when babies are only 9 months old!). I hope the moms out there who are trying to find good ways to expose their babies to early language experiences know to opt for the human interactions over the DVDs. There is so much advertising out there that tells us otherwise - arghhh! This is SO true. Kids *really* need the one-to-one interaction and no video is going to give you that, in fact I wouldn't even think about starting to show a child videos and such until about age 2. My kids did learn from watching TV/videos when they were toddlers, but before that it was just me talking to them (not at them!) all the time and it worked out really well for us. Hi Corey! What a wonderful posting *as usual, actually :D*! Sometimes we think that letting our children watching educative videos is enough .. while actually we should sit with them and explain what's on screen. Thanks for reminding me that cooing and singing to my newborn are important ... so just forget about cleaning the house for awhile :D!